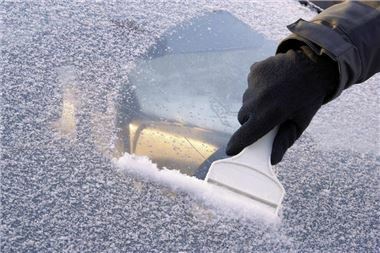 Ensure you have de-icer and a scraper. Before setting off, make sure you clean any ice or condensation from all the windows so that your visibility is clear. When you set off, do so in second gear, releasing the clutch and accelerating gently. As you drive, stay in higher gears to minimise the possibility of wheel spin. Stopping distances are increased by up to 10 times in icy conditions, so leave much more distance than usual between your car and the car in front. Bear in mind, after the frost has gone, ice can remain in areas which are shaded by trees and buildings, including bridges.